It’s been written how the vast majority of Americans have some form of debt. Some of it necessary (i.e., a mortgage or a car loan), while other forms of debt may be less than ideal. This includes department store cards or other credit card debt with higher interest rates. Credit cards are a useful financial tool, however, if you are someone with more credit card debt than you’d like, you’re not alone. According to a December 2018 report by NerdWallet, the average U.S. household with credit card debt carries an estimated $6,929 in revolving balances. Some say that the less-than-ideal debt may be one reason why the use of personal loans has grown, as people consolidate credit card debt, finance home repairs and pay off medical expenses with them, among other things. A 2017 report from American Funds suggests that as younger generations build up more debt, they could be carrying it all the way into retirement. What are the Root Causes of Debt? Before paying down your debt, you can benefit by first understanding the reason it exists. Greater knowledge of the causes of debt can help you choose how to pay it off. 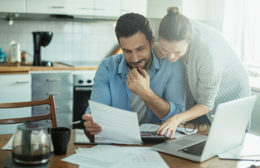 According to a recent article from Mybanktracker.com, these are the 10 most common reasons for debt in the U.S. Some, or all, of these reasons for debt could prevent you from ever retiring, you might think. However, there’s a lot to keep in mind when addressing debt before retirement. While some may plan on retiring at 65, others at 55 and maybe some even dream of bowing out at 40, an Employee Benefit Research Institute study suggests dwindling confidence in the possibility of early retirement. 11% of current workers under 55 say they expect to never retire. The American Funds report suggests people are retiring with more debt than ever, and that the younger generations are more likely to have a problem retiring. However, don’t let these statistics get you down. You can work to pay down your debt today and increase your chances for retiring at your preferred age. So how can you take action somewhat quickly to get yourself on the path to paying down debt? Debt consolidation is one strategy for lightening your load and paying off debt. Debt consolidation means that your various debts, such as credit card bills or loan payments, are rolled into one monthly payment. Debt consolidation is especially useful for people with excessive debt from credit card bills. When planning your retirement, it’s a smart idea to take control of this debt. According to Experian, American’s credit card debt jumped 2.7% from 2016 to 2017 – from $6,188 to $6,354. How Much Will Debt Consolidation Help? If you’re not sure about the value of consolidating debt, you may want to consider using Discover’s debt consolidation calculator to estimate savings on interest, as well as pay-off time. Rates on a personal loan can be lower than the interest on revolving debt, so you can spend less on interest. You can lock in a fixed rate so that your monthly payment won’t change, while other interest rates may be on the rise. Instead of managing multiple bills, you can plan your budget around having one fixed monthly payment when consolidating those debts. When it comes to retirement, there are many sources you can seek out for guidance. The important thing is to keep an eye on your financial future. Not everyone can have a perfect financial picture at any given moment – with a budget that allocates exactly what you need for bills, retirement, debt reduction and emergencies – but taking steps in the right direction is a great place to start. Whether that’s simply saving money on a daily basis, planning for the long haul, or lowering interest payments on debt, you’re stacking the building blocks in your favor towards the next phase of your financial life.